A cool feature that we recently noticed and wanted to share is that Google is now showing keyword performance data from Search Console directly in the search results. The data shows the amount of clicks, impressions and your average ranking position for the keyword that you searched for. The data shown is for the last 7 days compared to the previous 7 days. Please note, this will data will only show when you are the verified owner of the site in Google Search Console and only when your site is appearing in the search results. Also, this data will only be visible to you. 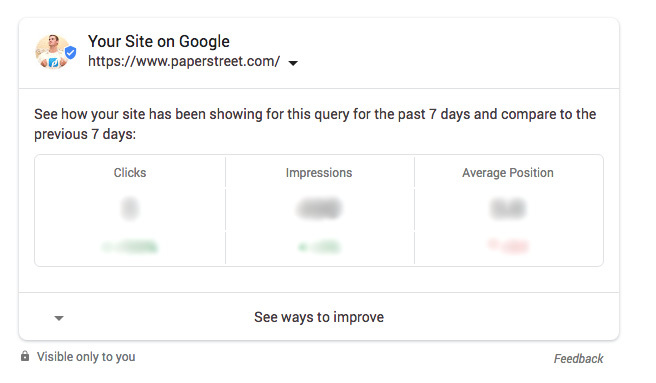 This is a nice feature that will show you how your search listing is performing for a particular query without having to directly access your account. We have included a screenshot below so you can reference this new discovery and feature.